Equipped with “must haves” in terms of comfort and relaxation, the huge terrace lounge seats up to 4 people comfortably and luxuriously. The open-air lounge converts into a king size sun-lounger in no time at all. Many details of the Monte Carlo 6 can be personalized, offering kitchen worktops and shower room washbasins in a typically Italian marble. There is also a choice of woodwork atmospheres between light brushed oak and warmer matt walnut. The wide selection of hull colours adds to this array of options that you can tailor to your desires. The Monte Carlo 6S boasts unique solutions in the private accommodation. The aft beam-wide master suite has an en-suite shower room fitted with a “rain shower”, as well as separate toilets. The layout of the VIP and guest cabins is unusual, with beds that offer different layouts. The many panoramic views and the sophisticated finishes immerse these private spaces in a unique atmosphere. At the centre of the main deck the steering station enjoys particularly pleasant lighting from the opening sunroof above. Offering perfect visibility, the single-piece windshield makes for safe driving on this sport cruiser. 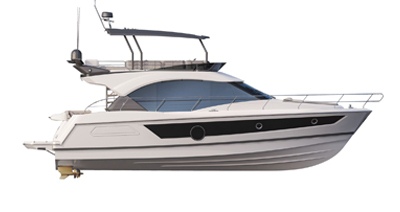 The Monte Carlo 6S is fitted with cutting edge navigation instruments, with 16” or 24” SIMRAD screens. Controls are integrated into the highly comfortable Besenzoni leather driving seat.